Besides than maintain a good healthy lifestyle, the first basic step to keep myself strong is well-hydrated. Not those processed / soda drink, is the most basic H2o which also known as water. WHY IS SO IMPORTANT ABOUT WATER? We can live longer without food but we will die within 3 days without water. Hope you get the point, lol. Majority of weight in a human being comes from water in the body. Our body composed of about 60% water and it plays a major role in chemical reactions taking place in the human body. I believe many of us drink boiled / filter water because tap water contains minerals, chlorine and bacteria that can jeopardize our health. 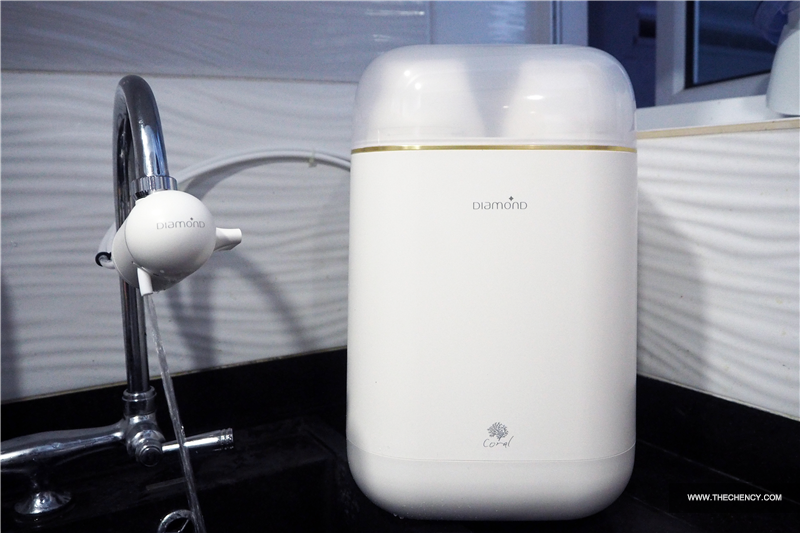 So recently, I have upgraded and installed a new refined water machine, DIAMOND Coral Gold; to make sure my family drink safely and stay away from doctor. 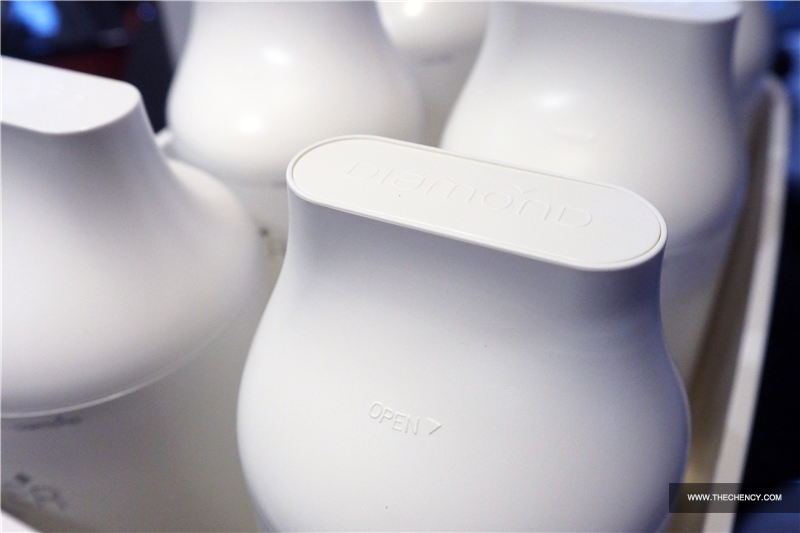 I believe many of you has heard about DIAMOND , the world renowned experts in water filter. DIAMOND is an International Water Filtration System leading brands in the market, founded back in 1996 under NEP Holding. 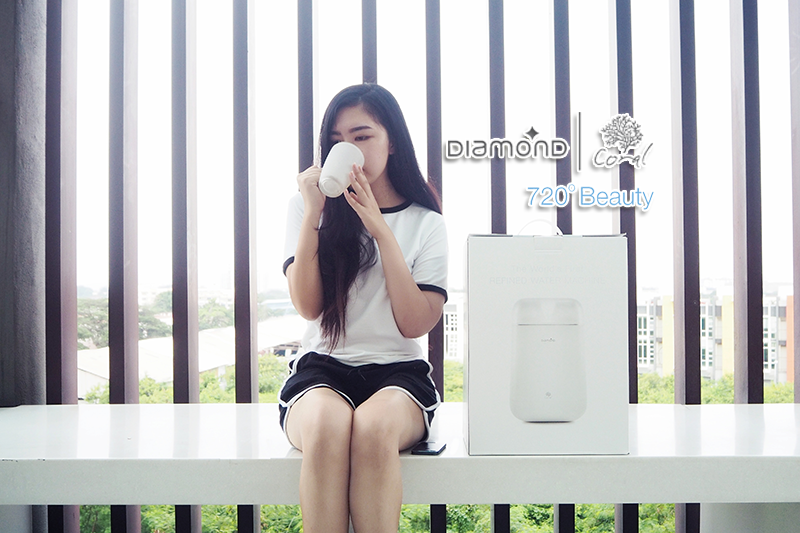 Water purifier sometimes may not seem blend-in with the kitchen's interior design but now I am glad that DIAMOND has came out the latest design called DIAMOND Coral series which incorporated the ART of Refined and Natural Live Water technology into our daily lifestyles through our household items. I choose DIAMOND Coral Gold to match my black and white theme kitchen. 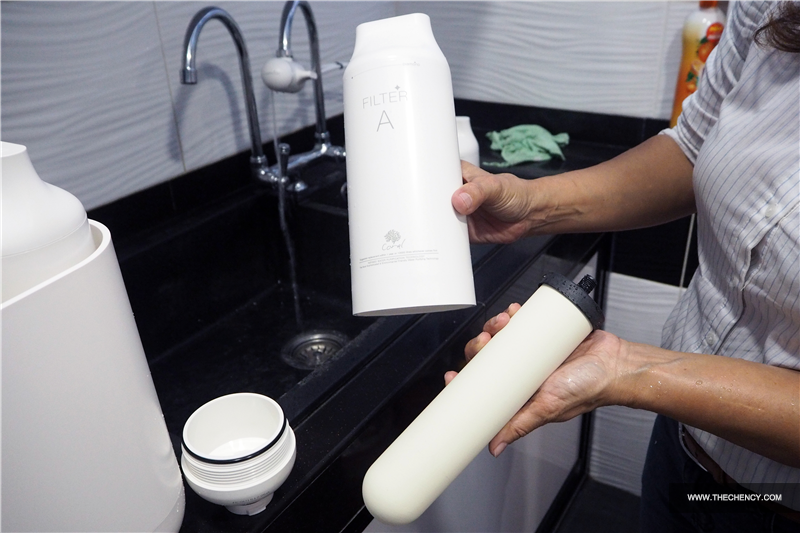 DIAMOND Coral water filters use 100% natural purifying materials such as as diatomite, coral calcium, coconut shells and bamboo charcoal base activated carbon. This system can purify harmful elements over a hundred times and it can get rid of radioactive elements found in the water while keeping intact the minerals vital to the human bodies. DIAMOND Coral Gold consists 6 filters to produce natural alkaline PH water. 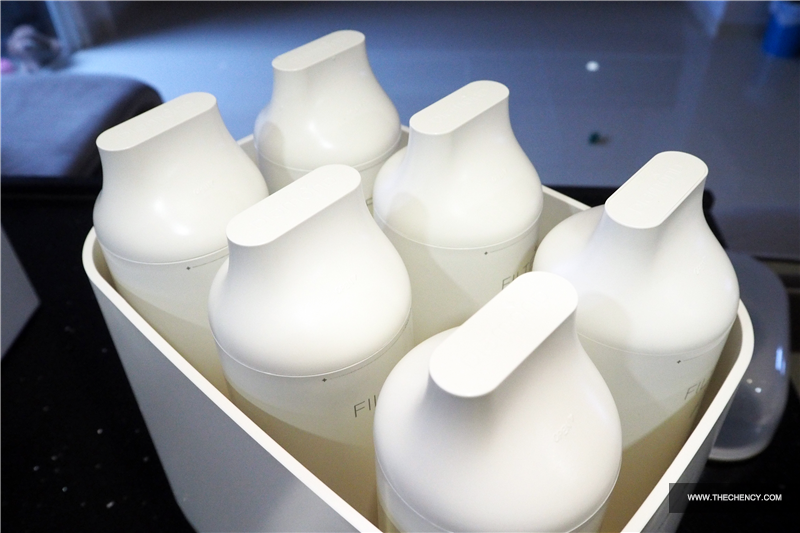 The system can filter various organic pollutants that are harmful to the environment and human bodies. Why is alkaline water good for our health? Alkaline water neutralizes the accumulated acidic waste in the human body and washes away the accumulated waste thus helping blood circulate. Alkaline water produces natural ionized minerals such as calcium ion, magnesium ion, sodium ion and potassium ion. These ionized minerals can be absorbed 100% in body. 6 different filters categorized with alphabet and I just need to clean Filter A every two months. The rest of the 5 filters will be serviced by DIAMOND under the Filter Replacement Service Plan. 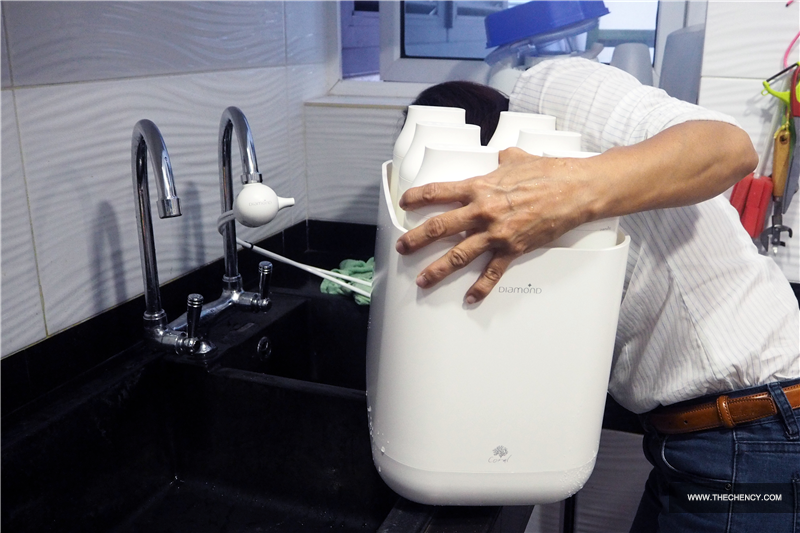 During the installation, the service agent will explain and teach us how to clean the Filter A and also how to take care of this water machine. Filter A is always located on the right of the machine. Just twist it in anti-clockwise direction and remove it from the machine. Then using a opener (provided from every kit) to open the lid. Because in the picture is still brand new so it looks white but after one or two weeks depend on how dirty is your water, the filter will turns into brownish or dark color. Thanks to the service agent for the patience to explain every single question from me and my mum. 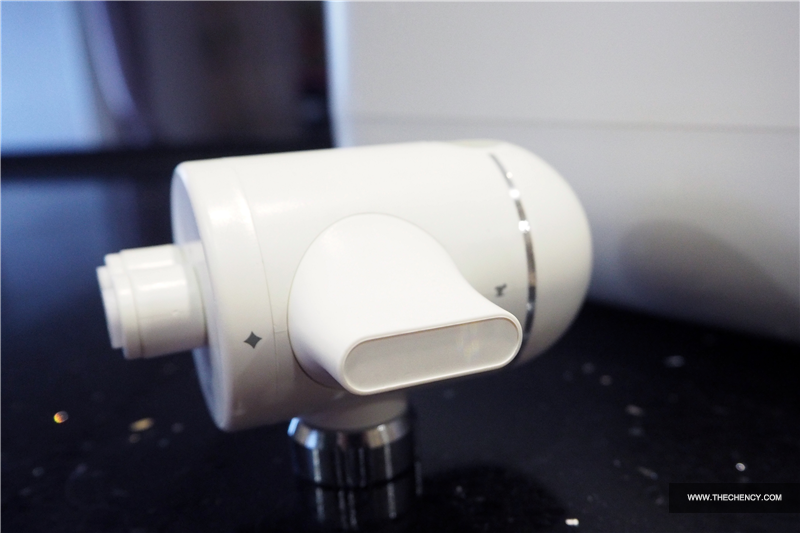 This is DIAMOND Diverter Switch which is attached to the end of tap so for those who have only one tap at kitchen, you can enjoy DIAMOND drinking water and tap water in a same time. Just switch the Diamond Diverter Switch to the diamond symbol to enjoy Diamond water and switch to the tap logo, means using tap water. Taadaa! DIAMOND Coral Gold looking modern, sleek and elegant, only takes a small area next to the wash basin. The white refined solid surface with silky matte finishing match my black & white theme's kitchen. The most important is my family now can enjoy safer water. DIAMOND Coral series has comes out with 3 different model which are Coral, Coral Gold and Coral Platinum. 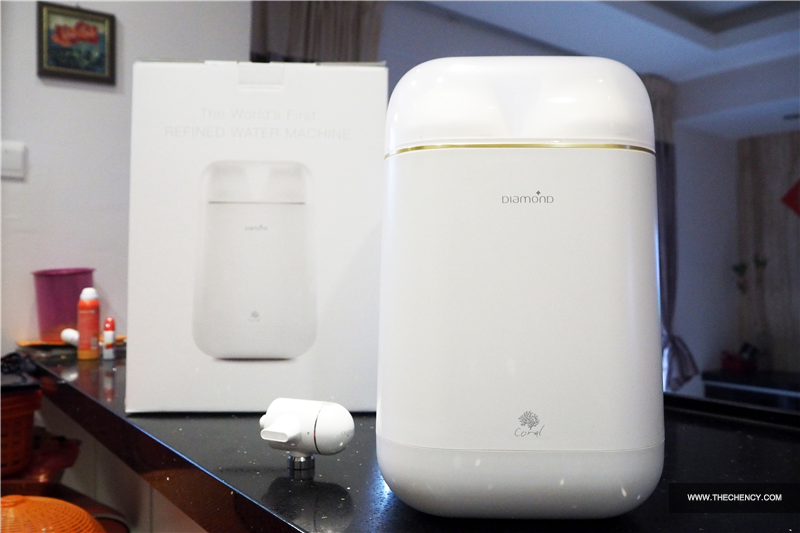 I choose DIAMOND Coral Gold which is a 6-filter design, is equipped with the function of enliven the water besides purifying for it has rather more space to contain more purifying materials. The water is so fine and it’s alkaline pH, guarantees surprises to your daily lives. DIAMOND Coral Cold is weight about 8.1kg with the size of 320mm (L) x 223mm (W) x 343 (H). The price is at RM 3480 (West Malaysia) / RM 3560 (East Malaysia) and the Filter Replacement Service fee per year is RM 1160 (West Malaysia) / RM 1187 (East Malaysia). NOW DIAMOND ACCEPTED TRADE IN YOUR WATER FILTER! No matter what kinds of brands or how long it has been used, DIAMOND is willing to offer trade in value up to RM 2500 for your used water filter to the masterpiece created by European renowned Refined Master, World's Forst Refined Water Machine - DIAMOND Coral, for FREE! No worry! There's is NO EXTRA CHARGE for your select preferred DIAMOND Coral model but only subscribing to the Filter Replacement Service Plan which is the expenses is similar to what you are spending for your water filter now. Keen? Click 'HERE' to check out how to trade in. this is for water purifier?